Mix your leftover turkey, or chicken, with broccoli in a creamy cheese sauce and top it off with a flaky crust to create the perfect Turkey Divan Pot Pie for dinner! Split the chilled dough in half and roll out the first half into a 12 to 13-inch circle. Place the dough circle in a 9-inch pie dish and set aside. Melt butter in a large pan or Dutch oven over medium-low heat. Whisk in the flour, mustard powder, salt, and cayenne pepper (if using). Continue to cook and stir for 1 minute until pale yellow and frothy. Whisk in the warm chicken stock, milk and sherry; heat until thickened. Add 2/3 cup of grated cheese and stir until completely melted. Add the cubed turkey (or chicken), stir to combine. Gently stir in the blanched broccoli. Pour the mixture into the prepared pie crust and smooth with the back of a spoon. Sprinkle the remaining 1/3 cup of cheese over the top. 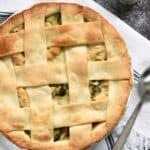 Roll out the remaining pie crust and place on top of the pot pie. I cut mine into seven, 1-inch strips and placed them on top in a lattice pattern. Press the edges to seal. Wrap a 3-inch wide strip of aluminum foil around the edge of the pie to prevent over browning. Bake for 25 minutes, remove the foil, and continue baking for an additional 15 minutes until golden brown and bubbly. Allow to cool for 10 minutes for the filling to set before cutting. *Technically a bechamel sauce would only contain milk, not include chicken stock, but close enough. I used Gruyère cheese, but cheddar, Swiss or Parmesan would work as well. The cayenne pepper is not a traditional ingredients in Turkey Divan, but it just felt like it needed a little something extra. Feel free to substitute ground black pepper if you prefer. I cooked my broccoli in the microwave with 1 Tablespoon of water for 3 minutes on HIGH. You can also drop into boiling water for 3 minutes, drain and drop into ice water for 1 minute.